“Odds & Ends” consisted of Wanda (December 29, 1952) and Larry Butler (January 31, 1951), and Jim Grant (August 26, 1955). Originally from Dorchester, GA, the youngsters sang in school and church before moving to Philadelphia when Wanda, aka Doll, was 13. Philly’s fast-talking disc jockeys Sonny “the Mighty Burner” Hobson and Jerry “the Geater with the Heater” Blavatt fascinated the Southern teens. Naturally talented, they formed Doll and the Odds & Ends and worked up some secular songs. Robert Hawes assumed the managerial duties after observing them perform at family gigs. Hawes got the ears of Bobby Martin and Thom Bell; an audition followed, and soon the group signed with Today Records as Odds & Ends. In the late ’70’s Mark King replaced James Grant and they recorded with United Artists as Unity, and after that as Three Million on Cotillion. 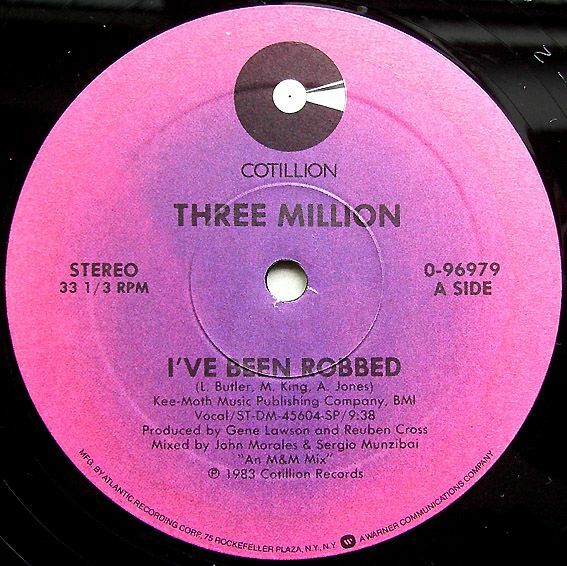 The first single by Three Million was “I’ve Been Robbed” which was mixed by John Morales & Sergio Munzibai.